Emu Casino is one of our top-rated real money online casino sites, loved not only for its great range of secure, instant-play slots and table games, but for the excellent bonus offers available for new and ongoing players. This article explores the bonus offers and promo codes required to take advantage of Emu Casino’s player incentives and how to claim these bonuses quickly and easily. Emu Casino is one of the few remaining gambling sites that offers players a no-deposit bonus, which means you can claim a bonus upon sign up without having to lay down any of your own money. Simply sign up for an account at Emu Casino and the vendor will credit your account with 12 free spins, with no deposit and no promo code required. The free spins can be used on a selected slot game only, and all winnings made from free spins are subject to a 25X wagering requirement before cash won through free spins can be withdrawn. The free spins bonus is available to players from Australia and New Zealand only. Note: The AU and NZ sign-up package is subject to a 40X wagering requirement, while other countries are subject to a 45X wagering requirement. The bonus money can be used on all games at Emu Casino excluding jackpot games and virtual sports, and the max bet size is $15. Bonuses expire within three days of activation and must be used within this time or they will expire. What promo code is required for Emu’s bonus? Emu Casino’s welcome bonus does not require any promo code or bonus code to claim. Just follow the steps outlined below when signing up and making your deposit and the bonus money will be yours. 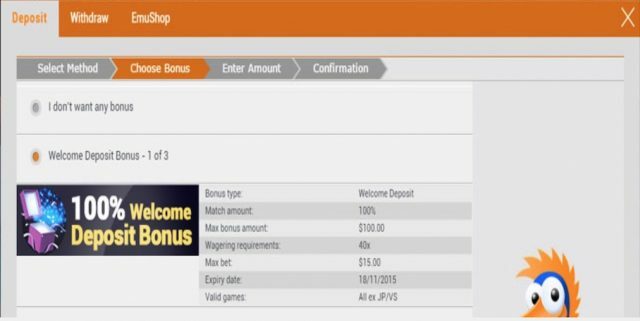 Follow the prompts to make your payment and complete your transaction and once the payment has been confirmed, your matched deposit bonus will show up in your Emu Casino account. For Australian and New Zealand players, the process to claim the no-deposit free spins is the same, however no deposit is required. Just sign up, activate your account via email and go to the deposit section to select the free spins from the Choose Bonus screen. Emu Casino Races – Opt in to any of the open Casino Races where you will climb your way up the leader board for every real money bet you place on a selected online slot game. The Races give you the chance to win more prizes on top of anything you win within the slot game itself. Birthday Bonuses – If you’ve made at least one real money deposit at Emu Casino and have provided verification documents that confirm your date of birth, you can contact customer service within three days of your birthday to receive a mystery birthday present. The birthday bonuses vary depending on your loyalty level with the casino, but can include free spins, free cash or special matched deposit bonuses. Emu Casino also has a loyalty rewards program, where playing for real money earns you EmuPoints which can later be redeemed for cash, casino credits and other prizes in the EmuStore. To learn more about what Emu Casino has to offer in terms of bonuses, deposit options, security, customer service and gaming software, read our detailed Emu Casino review here.